When you arrive at Komaki Station by train and ascend the west stairs, you will see a monument to the Nagoya Cochin chicken in front of you. "Nagoya Cochin" is a very famous type of chicken in Japan. As the name suggests, cuisine that uses the tasty high-grade chickens’ robustly textured meat and savory eggs is very popular around the Nagoya area. 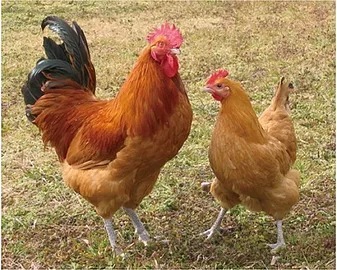 In fact, this Nagoya Cochin is a new cross-breed chicken, a mix of the Chinese "Bafu-cochin"and the locally-raised chicken in Gifu; it was bred by the Kaifu brothers, who lived in Komaki at the beginning of the 20th century. We are promoting Komaki as “the birthplace of Nagoya Cochin". You can eat dishes using Nagoya Cochin at the restaurant “Uraku” on the 2nd floor of the Meitetsu Komaki Hotel nearby Komaki Station, or at the restaurant "Healthy dining hall Plum House";.